Brief Summary: The Second Battle of Petersburg occurred during a four day span from June 15-18, 1864, and it began 150 years ago today. As most of Grant’s army moved from the Cold Harbor battlefield to Petersburg via the James River, William F. “Baldy” Smith’s Eighteenth Corps, took transports from West Point down the York River, and back up the James River to Bermuda Hundred, reuniting Butler’s Army of the James. It would be a brief reunion. On the night of June 14, Smith took two of his own divisions under Brooks and Martindale along with Hinks’ USCT division of the Tenth Corps, crossed the Appomattox River, and marched on Petersburg. 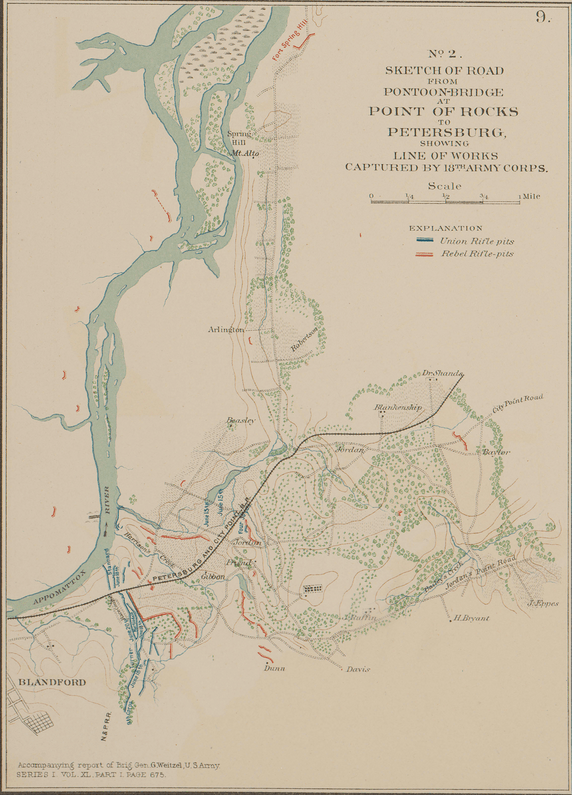 Click to see maps of the Second Battle of Petersburg, which should help you follow along with the action. Smith’s force reached Petersburg late on the morning of June 15, 1864, and what followed was one of the biggest missed opportunities of the entire Civil War. Smith had experienced the disastrous assault at Cold Harbor in early June, and he was determined not to repeat that debacle. After a careful reconnaissance of the strong but thinly held Dimmock Line east of Petersburg which took up most of the afternoon, Smith finally decided on an assault from approximately batteries 4 through 8 on Jordan’s Hill with a reinforced skirmish line. When it was determined to use the Eighteenth Corps artillery to support the assault, the guns were nowhere to be found. The Corps artillery chief, Captain Frederick Follett, had sent the horses back to be watered, and it took time to round them up and get the guns into position. By the time the artillery was ready. it was 7 pm and even more time had been wasted. Henry Wise, former Governor of Virginia, his Virginia Brigade and some Confederate militia were all that stood between Smith’s Corps and Petersburg. The assault moved forward that evening and succeeded in carrying batteries 3 through 12 of the Dimmock line, forcing Beauregard and his Confederate forces to retreat that evening and dig a new line behind Harrison Creek. The scarcity of Confederate forces had made success inevitable, but Smith had no real way of knowing this until he attacked. Hinks’ USCT division played a decisive role in the assaults, and several hundred men from Wise’s Brigade were captured. As much success as Smith had, he could have achieved even greater results, but he failed to push forward in the darkness. This despite having Winfield Scott Hancock’s Second Corps, Army of the Potomac available starting around 9 pm. Hancock and his veterans would have been there sooner, but a series of delays and the failure of anyone to notify Hancock that he needed to march quickly retarded his appearance greatly. Hancock and Smith conferred that night, but Hancock as the ranking officer deferred to Smith’s judgment as to the wisdom of a night attack. Smith chose to wait, an amazed Beauregard and his Confederate forces breathed a sigh of relief and dug in behind Harrison’s Creek, and Grant would never have a better opportunity to take Petersburg until the day it fell nine and a half long, monotonous, and bloody months later. The Petersburg Campaign Volume 1: The Eastern Front Battles June-August 1864: Chapter 2 of the book covers the Second battle of Petersburg. June 15 is described in detail from pages 35 to 86. The Petersburg Campaign: Wasted Valor June 15-18, 1864 by Thomas Howe: Howe’s book is part of the H. E. Howard series, and is the only one which focuses specifically and completely on the Second Battle of Petersburg.